Yes, Easter and the lead-in days were dogged by the heavy rain that has been the hallmark of the summer of 2017. But fans at the Fullers Waiheke International Jazz Festival – whose opening and closing gigs were outdoor – were not to be deterred. 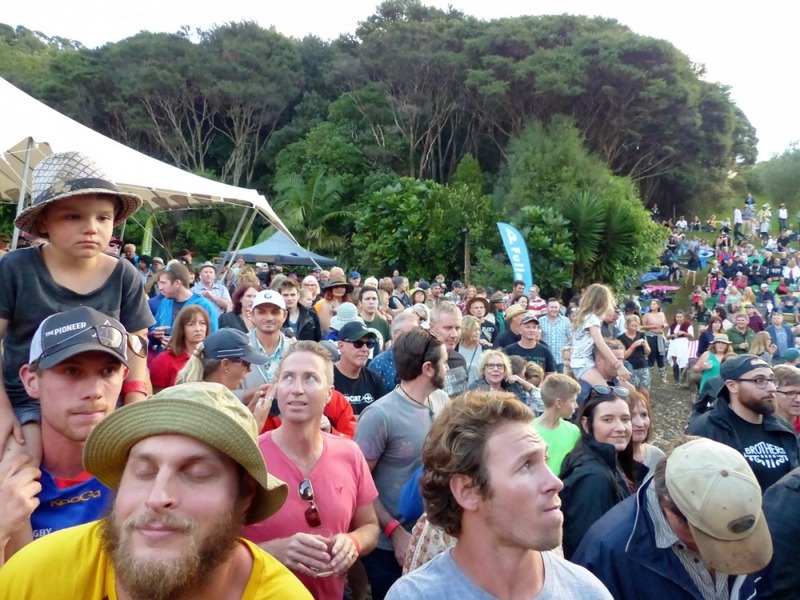 For the opening Good Friday Groove at Rangihoua Estate, the sell-out crowd simply did what sensible Waihekeans do – they took off their sensible shoes to become “as one” with the mud. Many returned on Sunday to find the Rangihoua team had worked wonders with hay and sand to provide a serviceable venue for the Grand Finale Concert. Between times, great music at various venues flowed like passing showers and the enthusiasm etched on punters’ faces affirmed that the weather gods continue to smile on festival director John Quigley and his team. 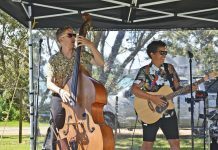 The biggest triumph over adversity had to be the Good Friday Groove appearance of Little Bushman, who flew from Wellington on a delayed flight on the morning of the show, minus their bass player – still stranded in Napier in the aftermath of Cyclone Cook. They played a truncated but mesmerising set – lead singer and keyboards wizard Warren Maxwell invoking a Maori proverb that “a small offering is a treasure”. Melbourne eight-piece The Cactus Channel lived up to their “cinematic” billing, channelling 1970s soul-funk and spaghetti western soundtracks with clever syncopated rhythms. But the crowd of 1200 largely saved themselves for drawcard act Dave Dobbyn and his band, who duly delivered with a string of well-worn classics. Wellington City Shake-Em-On-Downers and Sal Valentine and the Babyshakes. Across at Artworks Theatre, divas Allana Goldsmith and Nichaud Fitzgibbon drew a more sedate but appreciative crowd. reflective journey which included a couple of promising tracks from his forthcoming solo album. Worst Crowd Behaviour Award went to the party at Morra Hall on Saturday who let their children run loose in front of the stage while the parents talked loudly throughout the Peter Wood Trio’s set, oblivious to the music they and others had paid $49 to hear. Hardest working band? Hopetoun Brown were everywhere during the festival (including backing Dobbyn on Outlook for Thursday) and they really blew fans away in the intimate setting of John Quigley’s Aperitivo bar at Saturday’s Late Night Supper. 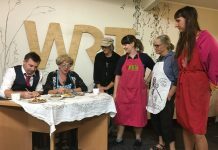 Other standouts: Auckland-based Miho Wada and band at Morra; the PJ Koopman Trio at Artworks while, on Sunday, the Stefan Nagler Trio impressed with surprise guests Cat Tunks and Edwina Thorne. In a heartbeat, it seemed, it was back to Rangihoua for the Grand Finale, where the prospect of mud did deter some fans second time around. But several hundred who did make it enjoyed a trail mix of festival favourites including Paul TT and Craig Bracken, Allana Goldsmith, Nichaud Fitzgibbon, Stefan Nagler Trio, Nairobi Trio with George Washingmachine, the Shake-Em-On-Downers and Sal Valentine and the Babyshakes. Next articleHistory sounds the warnings . . .